first of all the phenomenum we are presently considering is happening on a very short time scale compared to the billions of years our planet has already lived : a century represents only 0,0000025% of earth’s age ! It is of course possible to get some hints on what were the average climatic conditions on earth a very long time ago (say a couple millions years, or a couple of hundred million years), but it will not be possible to know precisely how things evolved over a century then. For example, it is not possible to know how the average climatic conditions evolved between 60.000.000 years before present and 60.000.100 before present (or between 60.000.000 years before present and 59.999.900 years before present). As we are basically interested in the survival and the comfort of our own species (the survival of the rest of the biosphere is meaningful only if we are still here : on a planet where humankind would have disappeared, knowing wether there would still be tigers seems a secondary question to me ! ), what happened before humankind existed (regarding the climate) is less interesting than what happened after. We have seen that, via drilling in the polar ice caps, it is possible to consult the “climatic archives” for the past 400.000 years with an acceptable (not to say high) resolution. This is already enough to learn a couple of (very) interesting things. In the past hundred thousand years, and over the whole quaternary era, the major cause of climate change has never been humanity (if we except the last century, of course) : it has been the consequence of the cyclic variation of some parameters of earth’s orbit around the sun, what modified the average amount of energy we receive from the sun. These variations of earth’s orbit have created some very long lasting “astronomic seasons”, just like there are “regular seasons” over a year. a variation of the excentricity : it is of current thought to consider that earth’s orbit is a circle. Actually it is not the case : our orbit is slightly elliptic. Over long periods, this ellipse is more or less elongated (its excentricity varies), what modifies the average earth-sun distance (and therefore the average amount of solar energy received). Without being perfectly cyclic, this variation has a period of about 100.000 years. a variation of the obliquity, a term the represents the angle that the earth’ axis (that goes from one pole to another) is making with the plane of the orbit the latter being also known as the ecliptic). This angle varies with time (it gets or loses 1°30′), with a period of roughly 40.000 ans. the astronomic precession : the axis that joins the poles moves along a cone whose axis is perpendicular to the plane of the ecliptic. This modification has a period of 26.000 years, and as a consequence every 13.000 years seasons are “interverted” along the orbit : on the point of the orbit where we had winter for an hemisphere, we then get summer. These astronomic variations, even happening with a slow pace, have been the major source of climate change over the last couple hundred thousand years. They have generated the succession of ice ages and “warm” periods like the ones we are now experiencing. Over the last 400.000 years (but it was probably alike since the beginning of ice ages, in the early quaternary era), these astronomic variations have generated 4 cycles almost identical, lasting a little over 100.000 years each, during which it was cold for almost 100.000 years (the average temperature was 5° C lower compared to what it is today) then much warmer during 10 to 20.000 thousands year (corresponding to the present average temparure, more or less) (diagram below). Evolution, during the last 400.000 years, of the mean surface temperature of the Antarctic. The curve gives the difference of mean surface temperature between today and the time before present represented on the horizontal axis. The temperature changes over the Antarctic are slightly more important than for the mean temperature of the whole planet. Be careful ! This graph must be read “backwards” : going rightwards is going back in time. The fact that the oscillations are more important on the left part of the graph reflects a better precision of the mesures (and therefore for the result) for recent periods. It is remarkable that over the last 400.000 years, the maximum of the yearly average of the temperature exceeded the present values by just 1 to 2 °C (average temperature on earth was then 16 to 17 °C compared to 15 °C today) ; the last time that we reached such values was 130.000 years ago. We are already in a “warm” period regarding the natural evolution of our climate. If everything evolved in a “business as usual” context, we should get near the end of the present interglacial period ans the climate should have a natural tendancy to get cooler. But such a cooling of the climate does not occur in a single century, even if the above graph seems “steep” when an ice age starts (going to the left). The fastest evolutions on the above graph are the loss of a couple degrees (Celsius) in ….5 to 10.000 years, whereas the present simulations predict a similar change in magnitude, the other way round, in…..one century. It is 50 to 100 times faster. A couple of degrees of differences for the average yearly temperature is not a minor event, far from that : when earth’s temperature was 5 °C lower, the sea level was 120 m lower and all Northern Europe and Canada were covered by a gigantic ice cap (one could hike from Vermont to Greenland) . A comparison between an ice age (20.000 years B.P.) an today for the Northern Atlantic . One can hike from France to England ; the sea level was 120 meters lower! As we have never seen 5 °C more for the recent periods (that is 400.000 years, still ! ), the only indications that we can get with such a temperature increase derive from the results given by the climate models, but it is already obvious that it would mean a major modification of our environment, and not a matter of putting on a light sweater instead of a heavy one during the winter. After the constitution of Earth, the primitive atmosphere that appeared on our planet, mainly as a consequence of volcanism (being itself a consequence of the energy released inside the planet by the natural radioactivity of rocks, then much higher than today), was mostly composed of CO2 and water vapour. Planets of the same kind than Earth (named telluric, as opposed to giant planets such as Jupiter or Saturn, that are bodies that failed to become stars), that have an atmosphere, but that never had life (Mars and Venus, to be precise), still have a majority of CO2 in their air, as it was the case in the primitive atmosphere of Earth. With much more CO2 in the terrestrial atmosphere a couple of billion years ago than today, the greenhouse effect was much higher then. But at the time the Sun was not as powerful as today, so that the average temperature on Earth was not high enough to prevent the apparition of life. The remarkable process that lead the CO2 concentration to decrease in the same time that the activity of the sun increased, so that the surface temperature always remaind beyond acceptable limits for life, is… life itself. Indeed, that apparition in the ocean, some 4 billion years ago, of primitive algae, able to perform photosynthesis, has allowed the progressive rise of a vegetal marine life that slowly suppressed most of the atmospheric CO2, today enclosed in lime, that is fossil remains (shells) of life at that time (a very small fraction also gave oil and gas, but it is ridiculous compared to lime). In the same time, this photosynthesis enriched the atmosphere in oxygen, that represents 20% of it today, and that could not remain at this level without life. It is also life that allowed the apparition of free nitrogen in the air that we breathe today. 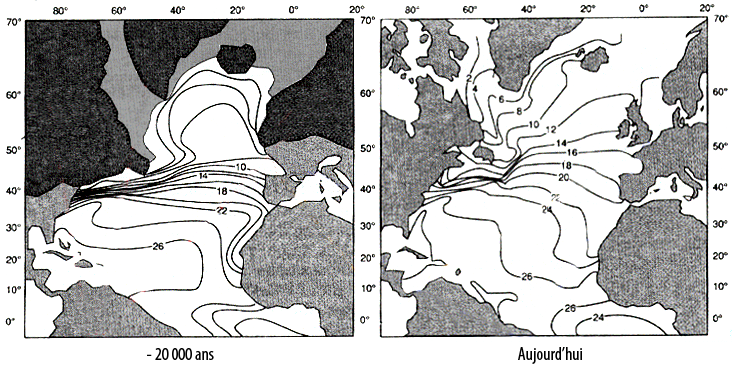 If we get back to our temperature issue, it is not easy to “guess” what it might have been at such ancient times. The temperature that existed on the surface of Earth 3 billion years ago, for example, cannot be deducted easily from mesures, because most of what existed then has since been burried at least once in the entrails of the planet, as a result of tectonics. For the marine floor, for example, it is not possible to get sediments aged more that 150 millions years : after this amount of time, they have been burried in the terrestrial crust. 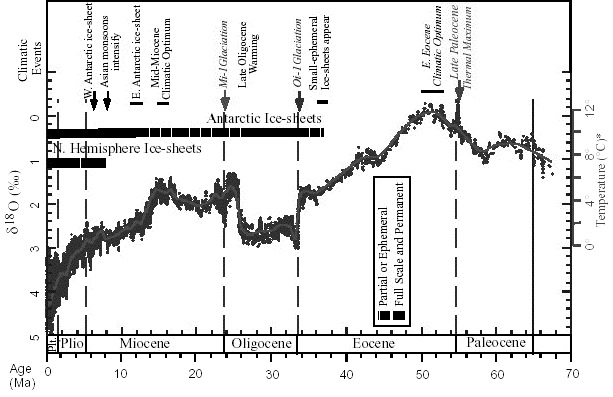 This still allows to have a look at how the temperature evolved since the extinction of dinosaurs (67 millions years ago), and it seems that it was generally higher than today, with a maximum of 10 °C over the present average if we go back to 50 million years. But the change did not take place in a century ! Estimation of the average temperature of the planet (compared to today, the 0 on the right axis being the present temperature) deducted from the proportion of oxygen 18 in an ensemble if 40 various lime sediments of the marine ground (right axis). The horizontal axis gives the time before present, in million years. Be careful ! A graduation represents 2 millions years, and the more one goes right, the older the times are. Let’s recall that the planetary average is today 15 °C, but if we calculate the average over the last million years, we will get something closer to 11 or 12 °C, because Earth has mainly experienced ice ages over that time. Here is another element that reinforces the idea that a temperature increase over 5°C in one or two centuries might be a major threat : compared to the natural variations of the average temperature over long periods of time, it would correspond to a (very) brutal change.